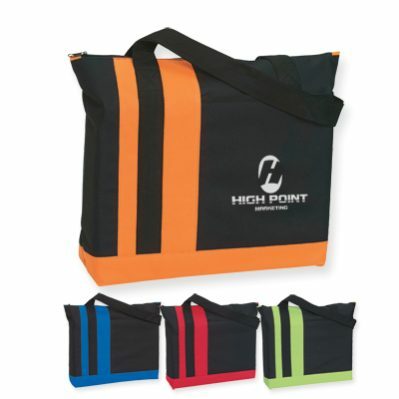 Personalized Black Totes Custom Printed or Embroidered, with Colored Stripes. Promotional, Inexpensive. Budget Prices in America. Wholesale black tote bags made of sturdy 600D polyester. Our large, tri-band, stylish totes are zippered and provided with a large front pocket, We also supply bulk blank (not imprinted) black totes. Budget Prices in America for bulk multicolor tote bags, embroidered or imprinted.